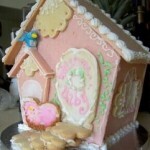 I came across this lovely and really unique idea for baby shower cake, why not have a Gingerbread baby shower house. The bit I have learned is that there is a bakery in San Francisco that makes them. 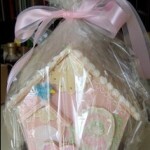 The houses are so darling is baby soft pastel colors. I have lots of relatives that seem to have babies in December so this would make a Fabulous presentation at one of our gatherings. So cute!